Courage, solutions, inventiveness, conflict, intuition, new beginnings. Mouse is not going to allow himself to feel trapped for too long. He knows there is a world of possibilities awaiting him, and that stumbling blocks will be conquered with courage and patience. Mouse is a quick and decisive little fellow, and doesn’t like to waste energy. He focuses on releasing only the energy needed to get where he needs to go. Recognize your abilities, and use your inventiveness to free yourself by releasing pressures and anxieties. Focus on expanding your potential, and know that your headway will gain momentum as you forge ahead. 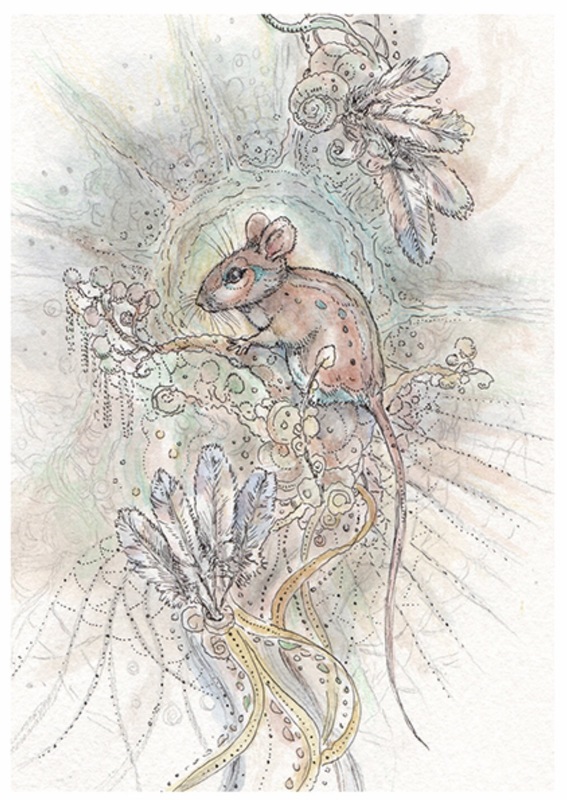 This entry was posted in Artist, Deck Review, Featured Card of the Day, General Tarot, Readings and tagged 8 of Feathers, Mouse, Paulina Cassidy, Spiritsong, Tarot.